Mediamaster is a service that allows you to store your music collection online and listen to your music anywhere. Once you register at mediamaster you can upload your music, or listen to other users uploaded collection. 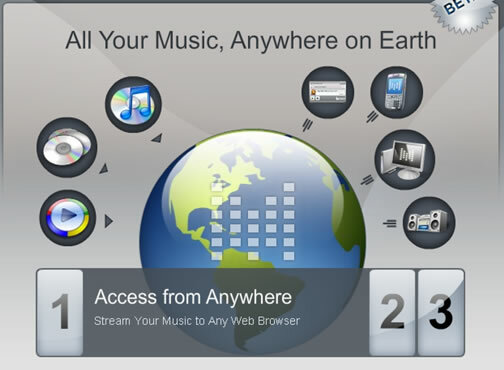 You can listen to your music from anywhere, from a PC, Mobile or from your media player. One can listen to others playlists or radio stations from sidebar tabs. You can also vote for the radio stations you like. Widgets are available for you if you would like to share your music as a widget in your blog. You can insert your radio link or playlist as embeddable widget. Currently the service is free and there is no upload limit, so you can upload your entire music collection, remember they do not accpet DRM music. What music you can upload: Most digital music you own that’s not fouled with DRM. We’ll take any non-DRM’ed MP3, AAC (aka M4A) or WMA (except losslessly compressed) file and add it to your account. At this time we do not accept FLAC, OGG, Wave (aka CD audio or uncompressed audio). We do accept AAC (M4A) losslessly compressed files. It’s important to us that you don’t put stolen music on the site. If you bought the CD or downloaded the MP3 from a legal service like eMusic, go ahead and upload it! The UI is built on Flash/Flex and it looks very good, but it is slow. Search is there but it doesn’t work properly, i tried to search with artist name but it didn’t work. I agree that this seems like a great idea but I went to the site and like you weren’t impressed with its search features or its speed. Hopefully this will be improved in the future, but right now, it’s just kinda slackin’. Plus, it seems that finding members with uploaded music is very hard right now. Maybe things will improve in the near future. I can’t recall the name of the service, but something akin to this existed briefly in the late 90s/early 00s. The main difference was that you just loaded the CD into your machine and the online service granted you access to their copy of the music. Long story short … eventually the RIAA shut them down for violating fair-use rights. Anybody remember what that site was called? Did I just dream this up? There’s a small download to your PC, but then even if you have 100,000 songs, you can instantly access from any browser. Mp3, Apple iTunes (non-encrypted), FLAC, Ogg Vorbis, even WMA is suppoted.